1.We covered the pen to where the cap starts with green duct tape for the stem. 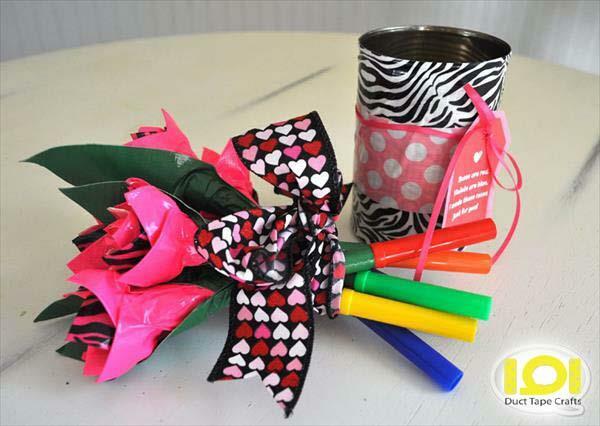 2.We made approximately twenty petals for each rose by cutting three inch pink and red duct tape strips. Fold the corners of one end to make it pointy and this will leave the other end sticky to attach to the stem. Repeat this with all your twenty strips. 3.Now we started attaching the petals to the stem first tightly and as we progressed to the outer petals, we made them more spaced. 4.When the flower was done, we camouflaged the untidy bottom of the flower with a green duct tape leaf. Cut a long strip (approximately 12 inches) and fold over four inches leaving another four inch to cover the bottom properly. Attach and press well. 5.Make as many flowers as you would like to and you can add more than one leaf. Arrange your flowers in the chocolate jar, tie a ribbon, add a note and this makes for an extra pretty bouquet that will any one’s heart.